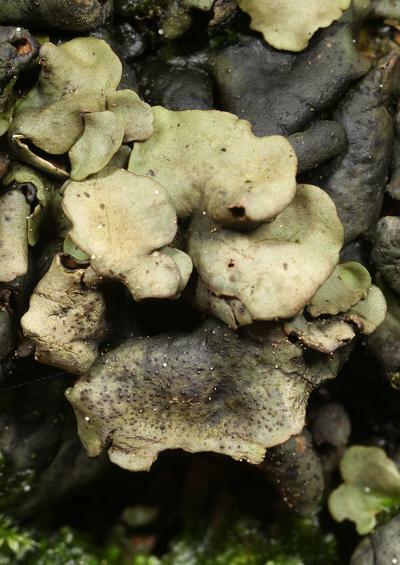 Verrucaria maura, Verrucaria mucosa and Verrucaria striatula are found on the shore, the latter two between the tides. Other lichens can also be found between the tides, e.g. Collemopsidium species can be found on limpet shells and barnacles; Lichina pygmaea, Black Lichen, on uppershore rocks and Lichina confinis in the splash zone. A few intertidal rock encrusting species of algae can be confused with lichens, these are Lithophyllum incrustans or Pink paint, the red Hildenbrandia rubra and the brown encrusting algae Ralfsia verrucosa or Limpet paint. See APHOTOMARINE for image of marine species.